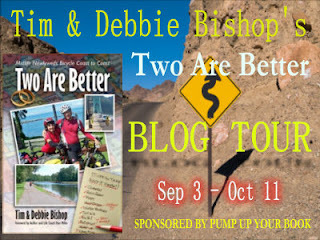 Tim and Debbie Bishop are on tour with Pump Up Your Book to promote their inspirational travel adventure memoir, Two Are Better. BLURB: From an engagement to a cross-country trip in just ten weeks? And with no experience in bicycle touring—or marriage? While Tim left behind a 26-year corporate career and familiar surroundings, Debbie was about to enter a “classroom” she hadn’t seen in her 24 years of teaching. Was it a grand getaway or a big mistake? COVER: Fabulous. I love it when an author or designer puts a great deal of thought into a cover, and that's what happened here. 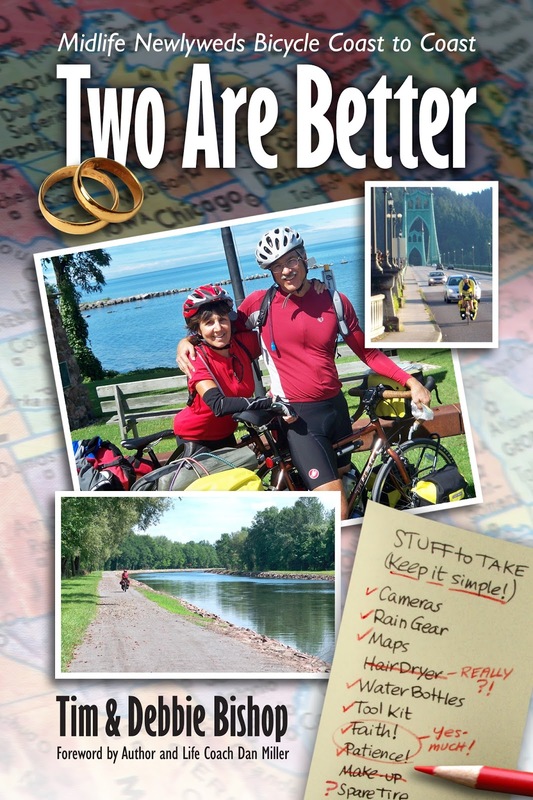 The book is a memoir about two people getting married for the first time at the age of 52 and embarking upon a cross-country bicycling tour. The wedding rings and the list are nice details. The globe makes a great background, and the pictures--like the ones inside the book--make a big difference. 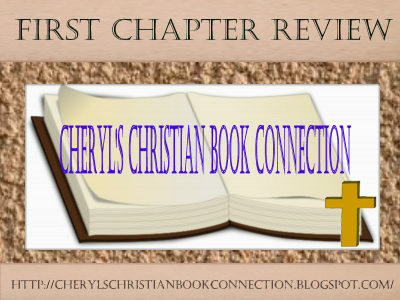 FIRST CHAPTER: Like a proper opening, the first chapter of Two Are Better starts at the beginning. Tim tells the story of how eight days before his retirement, Debbie and he were atop Cadillac Mountain in Acadia National Park, and he proposed. Then they both discover they have a dream to bicycle across America. KEEP READING: Definitely. After reading the Preface, I already had an idea of what Tim's style would be like. While he comes across as calm and steady, with an air of authority, you can also feel the excitement and spontaneity as this couple, brought together by God, quickly decides on their plans, figuring they will work the details out later. The first chapter isn't overly long; just enough to give you a feel for how this material will be delivered to you. But that opening certainly encourages you to continue. 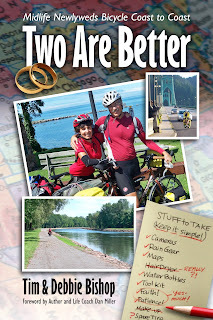 Two Are Better is refreshing and engaging. I look forward to reading more of the Bishops' story. I received a free mobi version of this book from the publicist. This review contains my honest opinions, which I have not been compensated for in any way.